3" x 5" journal with white 15 pt. cover printed full color with protective gloss coating. 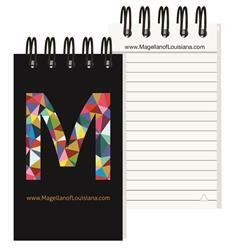 Back cover is durable thick 50 pt. chipboard in choice of colors, black will be used unless otherwise specified. 80 inside sheets, recycled 60 lb. white offset content. Recycled symbol printed in lower right corner. Logo and contact information printed in black on front of each sheet. Back of sheets is blank. Wire-O bound on top in black. Free name and logo on every sheet!